Proper Estate and financial planning is more important now than ever before given the uncertain future of the Social Security retirement system and the demise of employer sponsored pensions. Of course, financial planning is not limited to saving for your retirement years. On the contrary, financial planning should encompass both short and long-term goals. In addition, your financial planning should not occur in a vacuum. Instead, your financial planning should also be viewed in light of other plans, such as your estate plan. It also helps to have an experienced attorney to review that the financial plan is consistent with the Estate plan and the legal, tax, and probate implications of your plans. Ideally, financial planning should begin as soon as you start your first “real job.” Initially, the planning may consist of nothing more than learning to budget your money and forcing yourself to save a small amount from each paycheck. As your income, and your family, grows, financial planning will become both more necessary and more complex. Parenthood will bring with it the need to support your children in the short-term and plan for their higher education down the road. The desire to pass down an inheritance to your children will also play a role in your financial planning. In order to have assets left to pass down though, you must first make it through your retirement years. Consequently, retirement planning will also become part of your overall Estate planning endeavors. How Can an Attorney Help with My Financial Planning? One of the biggest mistakes people make with their financial plan is failing to consider how that plan will interact with other plans, such as their retirement plan and their estate plan. Because these plans share common elements, they need to work in harmony with one another. For example, a change to your short-term financial plans may cause a ripple effect that impacts your retirement and/or estate plan. Likewise, because your financial planning will directly affect the assets you acquire over the course of your lifetime, your estate plan will clearly be affected by your financial plan. An experienced Estate Planning attorney can assist you by all but ensuring that the decisions you make in your financial plan do not adversely affect your retirement or estate plans. In addition, your attorney can explain the tax and probate consequences of changes you may be considering to your financial plans. Because financial decisions you make today will impact your financial situation in the future, it is in your best interest to have a professional on your side to ensure that you fully understand all the tax, probate, financial, and legal ramifications of those decisions. 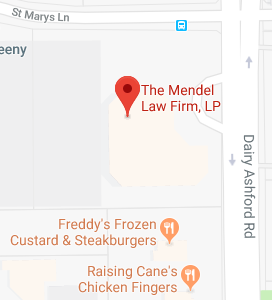 The Estate Planning attorneys at The Mendel Law Firm, L.P. are committed to helping you with your financial planning by providing advice, guidance, and practical suggestions that will ensure the success of your plan. Contact the team today by calling 281-759-3213 or fill out our online contact form.